Thomas Schreiner and Ardel Caneday are both New Testament scholars who are deeply committed to pastoral ministry. Schreiner was a pastor for fourteen years and now serves as Professor of New Testament at The Southern Baptist Theological Seminary. Caneday serves as a pastor and is Professor of New Testament studies at Northwestern University. In The Race Set Before Us: A Biblical Theology of Perseverance and Assurance, Schreiner and Caneday defend a Calvinistic view of the perseverance of the saints: It is not possible for a person who is a genuine believer to lose their status as a divinely elected person. The alternative position to this view states that a person can at one time be a genuine believer and then at a later time become a non-believer. While the authors refute the latter view, their concern is for those who might agree with them in principle but who fail to use relevant texts correctly. Since the focus of the thesis is on the use of the text in the life of believers, the book is pastoral in tone, attempting to persuade the reader of the usefulness of texts on perseverance for the assurance of believers. So, what distinguishes the view of the authors? First, the authors argue that proponents of opposing views miss a crucial temporal aspect of salvation texts. According to the authors, salvation should not be reduced to a past event, but includes a future fulfillment. Consequently, texts linking salvation to perseverance should not be taken to imply that perseverance is certain, given one’s salvation. Rather, and especially when it comes to the Pauline corpus, salvation is consequent upon perseverance. The authors argue that the future aspect of salvation is stressed by almost all metaphors of salvation in the Bible. Except for regeneration, conversion, becoming children of God, reconciliation, and forgiveness of sins, the Bible either emphasizes both past and present aspects or, as is the case with salvation, resurrection, eternal life, and the inheritance of believers, the future is emphasized over and above any past event. Thus, we should not stress the already aspect of salvation over the not-yet. If we do, we will misinterpret promise and warning passages. Second, the authors argue that God commends only those who obey God. Some might object that if God’s approval is dependent upon human obedience, then it is not grace. The authors argue convincingly that the objections rests on reducing faith to passive rest. The authors argue that the Bible’s view of faith is much richer than mere rest and includes an active persistence over time. The evidence for this is seen in the plethora of active metaphors the biblical authors use to describe faith. Metaphors such as running, fighting (1 Tim 1:18), following (John 10:26–28), and consuming Jesus’ body and blood (John 6:44–58) all stress the active, obedient nature of faith. Indeed, the authors point out that faith itself is an act of obedience. The authors argue that we should not take references to salvation as a reward (Heb 11:6) to entail that rewards are merited. Rather, given the active nature of faith, we should consider reward to imply the great value of salvation. The reward is given to those whose faith is active and only this kind of faith is commended by God: “God is pleased with faith that perseveres; God does not commend a person for a singular act of faith that fails to endure. God does not reward faith that does not go the distance.” Consequently, interpretations of warning texts should not shy from emphasizing the human effort in perseverance and should interpret salvation as a future completion of an event rather than a completed action. Is perseverance the necessary condition of Jesus’ statement? As the authors argue, it is not. Indeed, a statement of the kind Jesus makes is much more likely to mean that perseverance is the sufficient condition. If perseverance was the necessary condition, the subject of Jesus’ statement would have been those who will be saved. It would have read, ‘the one who will be saved perseveres to the end.’ The subject of a statement like this is usually taken to be the sufficient condition. If I said, ‘all apples are fruits from a tree’ I am saying ‘if it is an apple, then it is a fruit from a tree.’ Likewise, the subject of Jesus’ sentence is the one who perseveres. Plausibly, Jesus is making a general statement about all those who persevere and not merely one particular person. If so, then the subject of his statement is all those people who persevere. What about those people? Those people are the people who will be saved. In other words, if a person perseveres, then he or she will be saved. Since the text does not say anything about those who do not persevere to the end, the authors are right to reject Marshall’s implication. However, it is not clear that the reformed position (at least MacArthur’s version) is guilty as charged. It is possible to take MacArthur to be assuming from other texts that those who are justified are those who will persevere and then concluding from Matt 10:22 that those who persevere will be saved. In other words, the test-of-genuineness proponent may reply that though the completion of the saving act is in the future, the justification of a person who will be saved is a past event. Since being justified is sufficient to guarantee that a person will be saved, it can be argued that perseverance is evidence for salvation. In reply, the authors point out that the New Testament concept of justification includes reference to a future “verdict of acquittal.” The authors argue that since the future salvation of the believer is in view, a responsible interpretation should not imply that believers do not have to attend to warning texts. The authors go on to consider specific examples of those who fail to persevere. The authors examine examples of apostasy in general, Israelite apostasy, named members of a church, and compare Peter and Judas. They conclude that each example does not provide evidence for either the loss of salvation view or the loss of rewards view. They also conclude that the test of genuineness view is not supported either. The book ends on a pastoral note by arguing that perseverance is ultimately dependent upon a divine work and cannot be carried out without God acting. It is not difficult to imagine that the authors present their view with two types of readers in mind. On the one hand, there are those whose assurance is based on the most recent good or bad action they have done. For those who believe they can lose their salvation, the book provides a helpful reminder of their security and God’s power to keep those he has saved. On the other hand, there are those who may feel that warning texts may be brushed aside as irrelevant. The book offers a helpful, and pastoral, correction and argues persuasively that God has given us warnings to ensure the perseverance of his people. However, the authors mistakenly argue that their view is incompatible to other Calvinistic views. It is possible to hold one or more of the supposedly opposing views and hold to the view the authors present. Indeed, at least one of the opposing views is entailed by the authors’ view. The central concern of the authors is to show that warning texts serve as a means by which God ensures the perseverance of the saints. But surely someone who holds to the loss-of-salvation view, the test-of-genuineness view or the hypothetical-loss-of-salvation view see themselves as holding to a view that entails that the warnings serve as the means by which God preserves believers. Part of the problem is that the authors tell us that the relevant texts are the means by which God perseveres his people, but they do not explain sufficiently what the means is. If God uses warnings to ensure the perseverance of the saints, then we are led to wonder how those warnings achieve that end. Unfortunately, when the authors do attempt to explain, their explanations sound much like an opposing view. For example, at some points the authors’ view sounds like the test-of-genuineness view. On the test of genuineness view, the believer reads a warning and asks himself ‘am I persevering in the faith?’ If he answers no, then he has reason to think he may not be in the faith at all. On the authors’ view, the believer reads the warning passage and, by some unspecified process, is caused to persevere. But surely the obvious process is the process imagined by the test-of-genuineness proponent. Indeed, this seems to be the authors’ conclusion at several points. Two pages of chapter three is spent defending the thesis, “faithfulness is the proof of faith.” The authors argue convincingly that our actions, including our perseverance in obedience, reveal a person’s heart. In conclusion of their exegesis of 1 John 2:19, the authors write, “Thus, John properly concludes that people who are against Christ forsake the assembly of Christ’s people because they never truly belonged among us, for they never really belong to Christ.” And again, in the conclusion to the chapter, the authors surmise, “Who are those who have failed to persevere? They are the people who had varied responses to the gospel, but all proved, by their failure to persevere, to be imposters.” How are we to distinguish between the two views? The authors appear to shed no light on how why they think the two views are incompatible or why they think their view is different. At times the authors’ view sounds very much like the hypothetical-loss-of-salvation view. On the hypothetical-loss-of-salvation view, believers cannot lose their salvation but are warned by imaging what would happen if they could lose their salvation. The authors make a strikingly similar suggestion and argue that if believers imagine what will happen if they do not persevere, then they will persevere. They will conceive of the dire consequences of apostasy and be motivated to keep going. The authors suggest that in the same way that a driver might be motivated to drive safely by imagining the consequences of veering off the road, the believer is motivated to persevere by imagining what would happen if he or she apostatized. However, in the case of apostasy the Bible’s warnings are not of a probable consequence but only conceivable: “The Bible warns of conceivable consequences, not of probable consequences.” How are we to discern the difference between the two views? It is not even clear that the test-of-genuineness view and the hypothetical-loss view are even incompatible with each other. Might it not be the case that warning texts function by both inviting readers to imagine what would happen if it was possible to lose their salvation and to provide a test of the genuineness of their status? It might be replied that the book’s thesis is a reductive thesis – the warning texts are reducible to the means by which a believer perseveres. However, if this were the case, then the authors’ view would be eminently compatible with the loss-of-salvation view. Indeed, the loss-of-salvation proponent would presumably argue that it is their view that most emphasizes the warning texts as a divine instrument for the perseverance of believers. They might even respond by suggesting that on the other views, we have good reason to believe that the texts are useless since salvation is assured without them. Schreiner and Caneday offer wise council to those who have tended to skip over the warning texts of the Bible. Their suggestion that those texts are God’s instruments for our perseverance is sound and well supported. This is an important pastoral point. However, the authors fail to show why competing views are incompatible with their own. Schreiner, Thomas R. and Ardel B. Caneday. 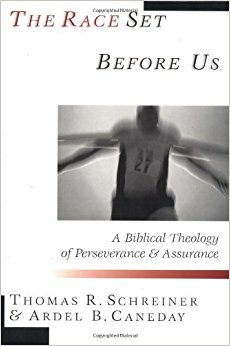 The Race Set Before Us: A Biblical Theology of Perseverance & Assurance. Downers Grove: IVP, 2001. In the book, the authors say necessary condition. But it is clear from their argument that they mean sufficient condition. Indeed, they are accusing MacArthur of interpreting the text to make perseverance the necessary condition. Ibid.